Looks like you are currently in United States but have requested a page in the Monaco site. Would you like to change to the Monaco site? 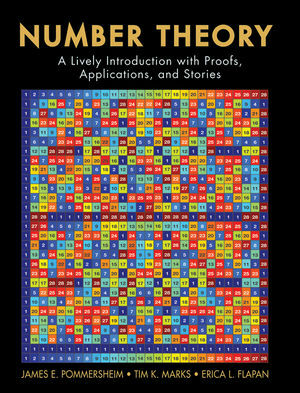 Number Theory: A Lively Introduction with Proofs, Applications, and Stories, is a new book that provides a rigorous yet accessible introduction to elementary number theory along with relevant applications. Readable discussions motivate new concepts and theorems before their formal definitions and statements are presented. Many theorems are preceded by Numerical Proof Previews, which are numerical examples that will help give students a concrete understanding of both the statements of the theorems and the ideas behind their proofs, before the statement and proof are formalized in more abstract terms. 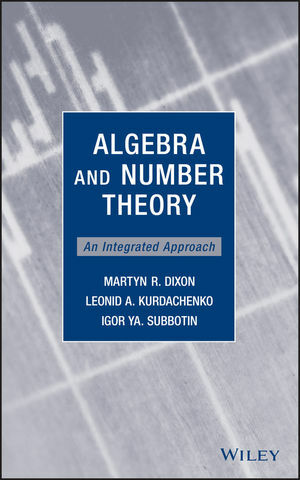 In addition, many applications of number theory are explained in detail throughout the text, including some that have rarely (if ever) appeared in textbooks. A unique feature of the book is that every chapter includes a math myth, a fictional story that introduces an important number theory topic in a friendly, inviting manner. Many of the exercise sets include in-depth Explorations, in which a series of exercises develop a topic that is related to the material in the section. James Pommersheim is the Katharine Piggott Professor of Mathematics at Reed College. He held post-doctoral positions at the Institute for Advanced Study, M.I.T., and U.C. Berkeley, and he served on the mathematics faculty at New Mexico State University and Pomona College. Pommersheim has published research papers in a wide variety of areas, including algebraic geometry, number theory, topology, and quantum computation. He has enjoyed teaching number theory to students at many levels: college math and math education students, talented high school students, and advanced graduate students. Pommersheim earned his Ph.D. from the University of Chicago, where he studied under William Fulton. Tim Marks is a Research Scientist at Mitsubishi Electric Research Laboratories in Cambridge, Massachusetts. Previously, he taught high school mathematics and physics for three years, and he worked for three years as a mathematics textbook editor at McDougal Littell/ Houghton Mifflin. Marks and Pommersheim have taught number theory at the Johns Hopkins University's Center for Talented Youth (CTY) summer program for 19 years. Marks earned his A.B. degree from Harvard University. He completed his Ph.D. and postdoctoral research at the University of California, San Diego. Erica Flapan joined the mathematics department at Pomona College in 1986. She held post-doctoral positions at Rice University and the University of California, Santa Barbara. Flapan has taught a wide range of mathematics courses and has numerous publications in topology and its applications to chemistry, including her book When Topology Meets Chemistry. She developed a course entitled "Problem Solving in the Sciences,” which aims to teach students the mathematics they need in order to succeed in science and economics. Flapan obtained her Ph.D. in knot theory from the University of Wisconsin and is the Lingurn H. Burkhead Professor of Mathematics at Pomona College. 1. Numbers, Rational and Irrational. (Historical figures: Pythagoras and Hypatia). 1.1 Numbers and the Greeks. 1.3 A First Look at Proofs. 1.4 Irrationality of he square root of 2. 2.1.The Principle of Mathematical Induction. 2.2 Strong Induction and the Well Ordering Principle. 2.3 The Fibonacci Sequence and the Golden Ratio. 2.4 The Legend of the Golden Ratio. 3.1 Basic Properties of Divisibility. 3.2 Prime and Composite Numbers. 3.3 Patterns in the Primes. 3.4 Common Divisors and Common Multiples. 3.6 Applications of gcd and lcm. 4.2 Finding the Greatest Common Divisor. 4.3 A Greeker Argument that the square root of 2 is Irrational. 5.1 The Equation aX + bY = 1. 5.2 Using the Euclidean Algorithm to Find a Solution. 5.3 The Diophantine Equation aX + bY = n.
5.4 Finding All Solutions to a Linear Diophantine Equation. 6. The Fundamental Theorem of Arithmetic. 6.2 Consequences of the Fundamental Theorem. 7.4 The Chinese Remainder Theorem. 8.1 The Number System Zn: an Informal View. 8.2 The Number System Zn: Definition and Basic Properties. 8.3 Multiplicative Inverses in Zn. 8.5 Encryption Using Modular Multiplication. 9.2 Reduced Residues and the Euler \phi-function. 9.4 Exponentiation Ciphers with a Prime modulus. 9.5 The RSA Encryption Algorithm. 10.2 Solving Polynomial Equations in Zn. 10.4 Applications of Primitive Roots. 11.5 Quadratic Residues and Lattice Points. 11.6 The Proof of Quadratic Reciprocity. 12.2 Continued Consideration of Charmichael Numbers. 12.3 The Miller-Rabin Primality test. 12.4 Two Special Polynomial Equations in Zp. 12.5 Proof that Millar-Rabin is Effective. 12.7 The AKS Deterministic Primality Test. 13.2 Divisibility and Primes in Z[i]. 13.3 The Division Theorem for the Gaussian Integers. 13.4 Unique Factorization in Z[i]. 13.6 Fermat's Two Squares Theorem. 14.1 Expressing Rational Numbers as Continued Fractions. 14.2 Expressing Irrational Numbers as Continued Fractions. 14.3 Approximating Irrational Numbers Using Continued Fractions. 14.4 Proving that Convergents are Fantastic Approximations. 15. Some Nonlinear Diophantine Equations. 15.3 Proof of Fermat's Last Theorem for n = 4. 15.5 A Geometric look at the Equation x4 + y4 = z2. Appendix: Axioms of Number Theory. A.1 What is a Number System? A.2 Order Properties of the Integers. A.3 Building Results From Our Axioms. A.4 The Principle of Mathematical Induction.